Few things are never meant to be, are they? They look to be in rhythm, they look perfect, they look unadulterated, and yet, they fail… well, this is where destiny steps in, it looks around, seemingly not convinced and then shakes up things! For Delhi Daredevils, it has to be destiny, it has to be fate, a cruel joke, not mirth, only few disjointed pieces of puzzles which are thrown in together, more in hope, than conviction! 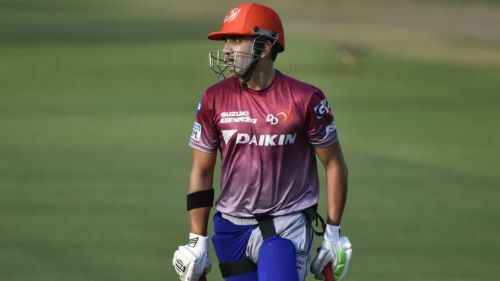 Gautam Gambhir wanted to go back to where he started, wanted to move up north from his adopted bastion in Kolkata, wanted to lead his home franchise, wanted to mould a story, wanted to script something for the ages, alas, it lasted for only six days, never quite convincing, always floundering, never diving beneath those erratic ripples, he is now gone! For all the smokescreen, Gambhir is man who wears his heart on his sleeve, he never minces words, he never wants to splash around, he wants to be in control of what he does, he did control what he wanted, he stepped down, far away from the never-ending reversals, away from the incessant glare, away from his ‘dream’, he woke up to reality! Well, all this is true, but not in the case of Gambhir, he never wears the mask, he is what he is, seldom pretending, never fictitious, the world always knew that, and he reminded them again, perhaps all over again! "I take full responsibility for the position we are in. And looking at the position, I have decided to step down as captain. Iyer will take over. I still feel we have the team to turn things around this IPL," Gambhir said while addressing the media. Yes, there was disappointment but no traces of remorse, he wants to be the master of his own fortune, no liberties taken or given! He has won World Cups for his nation, he has batted with pride every time he strides out, he leads with passion, and when he lost, he was willing to embrace failure with aplomb. No shame is conceding defeat, no shame in accepting you were not good enough! And Gambhir was not good enough, his strike rate against pace this season is 70, against spin is 153. He struggled to get going against pace, never stayed long enough to face spin, scored 85 runs in five innings, never looked the batsman, nor the leader Delhi wanted him to be! "It was absolutely my decision. The management didn't pressurise at all. It was the right time to step down," added Gambhir. We believe him, we know the man, he is opinionated with the bat, with the microphone, on social media, and everywhere he goes. He knows the time to up the ante, he knows the time to take a step back, or two, or take that decisive step. Some people revel in expectations, back when Gambhir took up the mantle of KKR, there were no expectations, he soared with the team, coerced the city to accept him and the team, he became Gautam da. Like fine pottery, expectations are brittle, you press on them hard, they are bound to crack, perhaps, the expectations from Delhi Daredevils were just that: intense, pointed… perhaps, Gambhir is human too…perhaps he cracked! Although Gambhir yearned to be back, he was isolated here, he was swimming in a stream which had consumed personalities before, Delhi Daredevils, the perennial underachievers expected him to waft a wand to turn the fortunes around, they forgot that people drowned in this very stream… and alas, Gambhir drowned too. Being a leader is not only about walking to flick that coin, or to tinker with fields, it is much more, it is about laying a groundwork and then stepping back, allowing others, the prodigies to take over… all the while being in the background with that beaming smile!